Partners must share a barbell, kettle bell and plyo box. The clock starts at the Buy-In and stops when the Cash-Out is finished. The rowing and running can be split up between partners. Both partners must compete the 49 burpees of the Cash-Out. On Nov. 5 2009 at 1:34 p.m., a terrorist named Major Nidal Hasan attacked fellow soldiers and civilians at Fort Hood, TX. He killed 12 soldiers and one civilian and wounded 43 others. 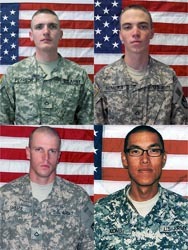 SPC Frederick Greene, 29, of Mountain City, TN, PFC Aaron Thomas Nemelka, 19, of West Jordan, UT, PFC Michael Pearson, 22, of Bolingbrook, IL, and SPC Kham Xiong, 23, of St. Paul, MN, along with eleven of the wounded were active CrossFitters in the 20th Engineer Battalion, home to Lumberjack CrossFit.